Layer (either Perfect Plum or Whisper White) – 3 7/8 x 3 7/8. Top two run completely through the Elegant Dots Embossing Folder, last one only the top 2/3. Add using dimensionals. Strips – first one Silver glimmer – 5/8 x 3 7/8 an 3/8 x 3 7/8, second one Mint Macaron – two strips 1/4 x 3 7/8, and third one 1/4 x 3 7/8. Cut two different sized Lots of Labels from Whisper White, stamp splatter in Mint Macaron and greeting in Night of Navy, later using dimensionals and add using dimensionals. 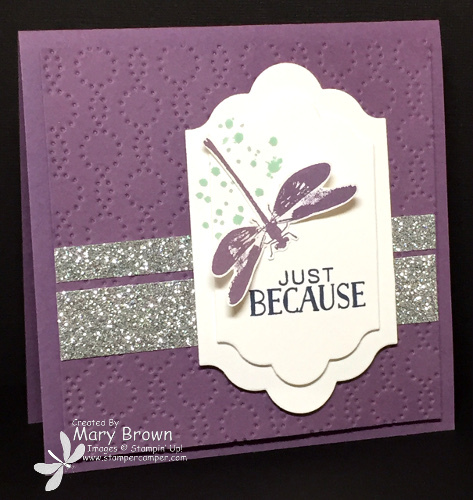 Stamp dragonfly using Perfect Plum on Whisper White, cut out and add to card fronts. For third card, add some Basic Rhinestones to finish off. So…which one is YOUR favorite??? And speaking of favorites…we have just released Create with Connie and Mary July 2015 Mini Session – 5 FABULOUS projects. It’s a PERFECT time to join! 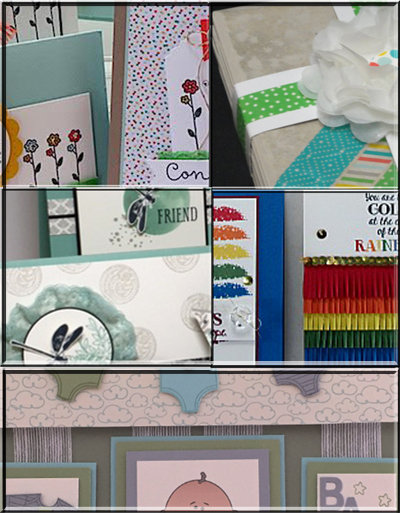 This entry was posted in Challenge, Clean and Simple (CAS) and tagged Awesomely Artistic, Tin of Cards. Bookmark the permalink. I love them all, Mary! Beautiful and definitely something I shall try on my own. I never say CASE because even if I start out trying to CASE something, it never turns out as I saw it. Thanks for the inspiration! They are all gorgeous. I can’t pick a favorite. The last one with th e sparkle and bling!! Great job!! They are all fabulous Mary! But if I had to pick one… the 2nd one! I love the balance of colours! Hey Mary!! Such a great set of cards. Great color choices.Hey Kara!! Awesome card. Super CAS. I love how you inked the corner with those vibrant colors. Thank you so much for playing us this week at CASology. Hey Mary!! I’m not sure why my comment combine your comment with another one. I’m sorry about that. I tried to delete it but I couldn’t. So sorry about that. The 1st is my favorite because I love purple! All are very nice. I liked each one as much as the one before….but really couldn’t pick just one of them however my DH is going to be unhappy because now you are making me want that stamp set. Thought I could resist it because the dragonfly was really the one image that I liked….and now I like that dragonfly way too much! Gonna have to go buy that renegade framelit for the dragonfly, too….oye!! !